Christian Rapper Lavoisier @Lavoisier_GTHU endorses false teacher Joyce Meyer and refuses to repent. 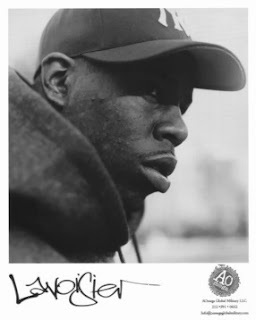 Lavoisier is a Christian rapper from Brooklyn , New York. He is known for mixtape "rap terrorist". 1 Timothy 4:16 says " Keep a close watch on yourself and on the teaching. Persist in this, for by so doing you will save both yourself and your hearers." Lavoisier is a well known rapper whom a lot of Christians listen to including myself. He should pay close attention to his doctrine because a lot of people are listening and watching him. I am not saying we should look to man for guidance because we are called to look to Christ through scripture(Acts 17:11), I am saying every christian has to watch their doctrine and who they endorse because it misleads people. Lavoisier is in sin because he endorses heretic Joyce Meyer in violation of 2 John 1:10-11, Romans 16:17 etc. I found this retweet after tweeing to Lavoisier how good his music was and going through his tweets. I found the Joyce Meyer retweet and then proceeded to dialogue with him and rebuke him in love after which he called me a sucker. In this screenshot, you will see that the first tweet is the tweet Lavoisier retweeted. @metroclus just know, it was most definitely intentional. I responded with these tweets and Lavoisier has not responded yet. At this time, I would encourage Christians to stay away from his music as he does not pay close attention to doctrine. We cannot endorse Lavoisier until he repents of supporting heresy spread by Joyce Meyer. Categories: Christian Rapper Lavoisier endorses false teacher Joyce Meyers and refuses to repent.